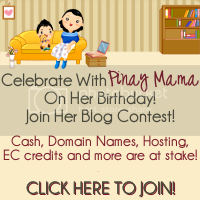 Let us celebrate Pinay Mama on her birthday by joining her blog contest. There are lots of cool prizes to be given away like cash, domain names, hosting, EC credits and more. There are four simple steps to join just click on the banner below for more details. 4 winners of $5 via random.org for the first 13 contestants who completes the requirements! The contestant with the highest number of referred people to the contest will win a Baby Bond Nursing Sash Couture worth $35. Contest runs from February 14 to March 8, 2011. Winners will be announced on March 15, 2011. This entry was posted in Blog Contest and tagged blog contest. Bookmark the permalink. Good luck sa atin sis 🙂 btw, congrats dito sa blog mo first time ko here submit all your blogs to me i will put it in my real pinay blog thanks.